Delivery firm UPS has today (9 September) confirmed the purchase of 125 new hybrid electric delivery trucks in the US and begun trials for its first range-extended electric vehicles in the UK. The new trucks, which will deliver up to four times the fuel economy of a conventional vehicle, will be deployed in Arizona, Texas, Nevada, Mississippi, Alabama, Georgia and Florida the first half of 2016. Costing slightly more than similar trucks with conventional engines, UPS said its ongoing sustainability commitment to reduce the environmental impact of its fleet influenced the purchase decision. 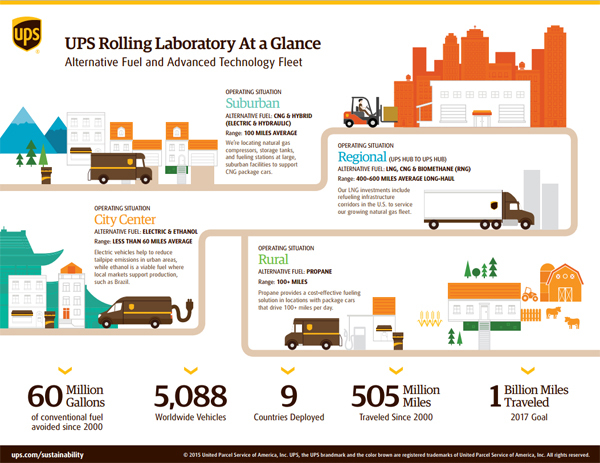 The initiative is part of UPS’s Rolling Laboratory, a new approach to optimising the use of alternative-fuel and advanced-technology vehicles. Also announced as part of the group's Rolling Laboratory programme today, UPS has launched a UK trial of its first range-extended electric vehicle which could travel 'several hundred kilometres' further than conventional EVs. Working with TEVVA Motors, the delivery firm has developed a prototype for a vehicle that can cover more than 200km on top of the normal range of 75-100km. UPS Europe sustainability director Peter Harris said: “With around 5,800 alternative-fuel and advanced-technology vehicles worldwide, sustainability is more than a practice at UPS - it’s a value. "This vehicle highlights our commitment to integrating new technologies into our delivery fleet. The new range will be deployed in Barking, East London, covering about 100km to 150km per day. The vehicles have a small but highly efficient diesel engine, which works as a generator and can recharge batteries on the road if they start to deplete. 'Geo-fencing' technology used in the EVs will help further reduce impact on air quality. The prototype will initially run for 12 months, after which UPS’ Rolling Laboratory will analyse the results to see if it is a viable use for widespread UPS operations. Transport is seen as a viable catalyst in reducing fuel miles and increasing air quality. According to UPS’ sustainability report, the firm tripled the number of miles it drove on sustainable fuels in the last year. A number of other delivery service companies such as DHL are incorporating 'reverse logistics' - moving a product/waste from its point of consumption to the point of origin to recapture its value, as part of a circular economy package which decreases the amount of empty miles a vehicle uses. Royal Mail is using a telemetry programme, to analyse driving styles and suggest efficiency recommendations through an in-cab communication system. This is allowing the company to stay on track in cutting emissions by 20% by 2020 against a 2004 baseline, despite a rise in carbon intensity. And in other industry developments, the sharing economy is beginning to disrupt the entire delivery business model. Scandinavian 'social delivery service' Nimber - which asks an online community to deliver packages as part of a commute or regular journey - is now growing in popularity in the UK, having cut carbon emissions by 198 tonnes in Scandinavia.